I love the geometry of the back of the tanker. Somehow it connects with my extensive study of 'Zen' and Eastern philosophy. Japanese design, simplicity, space, balance of the asymetric, the journey - where we stay still and the world moves around us. I decided to research the creation of large disk hangings, so similar to the backs of tankers. Firstly, I contacted a boron drum maker called Danny McCormack in County Cork, Ireland. He was very helpful suggesting that I use thin beech ply, in two or three laminates. He suggested creating a disk template out of chipboard or similar, bending the thin ply around this, glueing each layer, at a different fixing place to give the disk strength and stability. He imagined that the disk size I wanted, i.e. 5 ft. or 6 ft. diameter would need cross struts for hanging and support. 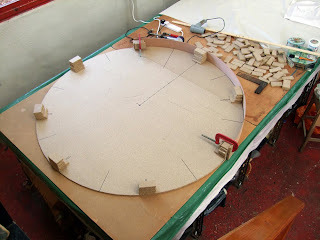 In my studio, Mel made a disk template and I helped him hold, glue and clamp the ply, the disks being 5 inches deep. Firstly, he created the disk, glueing blocks to make an upright to keep the ply vertical. He then clamped the first piece of ply to the blocks. Large clamps were used to hold the ply in place round the template. Layers of ply were glued together and held in place with tiny clamps at regular intervals. The disk would be in three pieces to allow transportation. The lengths of ply were staggered, creating a slot at one end and a 'tongue' at the other for joining. One of the problems was that he used my ancient pva which meant the laminates came apart. Such a shame because of all of the suggestions I have had since, these disks are the most professional. These two disks will be for wall pieces. I liked the idea of displaying five or six disk hangings, 5 ft diameter to represent the length of a tanker. (I would have liked a tanker body to hang them in and have just discovered today that panel beater, John, who repaired my car, has just scrapped one. Arrhh!) Researching the creation of free hanging disks which will be seen from both sides has been a nightmare. Alkathine drainage pipe was suggested. It could be easily joined by inserts of smaller pipe. It twists and will not hang square. Round metal pipe comes in various thicknesses. Again, it is unstable at that size. Also, it would have to be bent around a template and thus would not be absolutely round. Also there is copper piping. Bending this is a problem. It needs a spring insert to stop it collapsing. My favourite is mild steel bar, which I would like to rust and then seal. These would be very heavy and may 'droop' I am told. That wouldn't worry me and I love the idea that these would be made on rollers in the same way as a tanker is made. My worry would be that a child may walk into one or knocked they may spin. It would need two hanging points. There is square box section. This would be difficult to turn. a) A piece of aluminium which I put through the rollers. b) A length of mild steel which I bent in the rollers at college. FIXING THE SILK TO THE DISK. My main problem for these disks is that they will have to be transportable, which means that they will have to be in sections. Two sections would be sufficient. This means that the fabric will need to be removable. My original wish was they they would be 8 ft. diameter but I realised that, for my show, they will have to be smaller. Silk is 54 inches wide, 4 ft. 6 inches, therefore anything over that size would have a join. Fixing has been a nightmare, screwing, glueing, etc. The only two I like are, a piece of elastic threaded through the seam and stretched over. (Only suitable for wall pieces) and tiny clamps - similar to hair grips I suppose. After spending so much time on disk technology, I am finding that I actually love my fabric to drape and flow and am considering hangings, which will allow me to do what I do best, fabric design and it will give me much more freedom with the drape of the fabric. My research will not be wasted but I must now create the designs for my show.